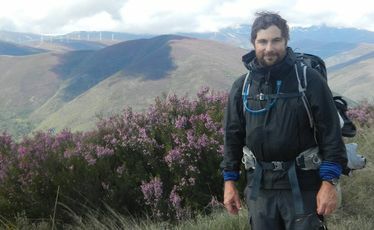 AFTER 27 days we've reached the Camino's highest point and Cruz de Ferro, one of the pilgrim trail's most sacred spots. From the time St James made his pilgrimage across Spain over 1000 years ago, the wooden cross of Cruz de Ferro has always been an important marker on the Camino. In past centuries it was a winter way-marker, showing pilgrims the path over the snowy Rabanal Pass. But in recent times it's become a spiritual focal point on the walk, where most pilgrims now leave a stone from home and make a prayer or wish. As a result, it's now viewed as a place "to leave one's worries behind". Our new friend Lindy had a stone from each of her yoga group members in the US, that she'd carried all the way to the monument. It's certainly a place for pilgrims to stop and reflect on their own lives. I left behind a rock bought from a little girl who had set up a small stall in the stunning mountainside village of Rabanal del Camino (where we'd stayed a freezing windblown night in the tent), and who was trying to make pocket money drawing pretty patterns on the stones. Lisa and I both made our wishes, then climbed past the Camino's highest point (1517 metres) a short distance from Cruz de Ferro and gazed at stunning vistas of snow-capped mountains with fields of purple lavender and others of reds, yellows and greens. It's the first really steep climb we'd had since the Pyrenees. But it wasn't a slog. Instead, with narrow cobbled paths and warm, calm weather we were finally experiencing the Camino I'd imagined before we began. It's also a steep rocky decent. But arriving in El Acebo, a village hundreds of years old perched high up on a steep 30-degree incline, was the perfect way to cap one of our most enjoyable days on the trail. With stone balconies overhanging a central gutter in the road, El Acebo offered us a glimpse into a now vanishing world. Its population numbers barely 100 and it remains a pilgrim village, with a range of albergues, refugios and hotels. It's not our last mountain climb - in two days' time we'll face perhaps our biggest challenge. The climb to O Cebreiro is shorter, just eight kilometres, but is reported to be brutally steep in three sections of 2.5km. O Cebreiro might be home to just 20 people, but the views out over the green Galician mountains are said to be breathtaking. From there, there'll be just 150km to go. Route marker: 575km down, 200km to go.